In our Tactics Tuesday series, FFG breaks down the formation and strategy of a particular squad, covering teams in club and international soccer. Each edition also includes a section detailing how Bob Bradley could make use of that club’s strategic principles. But today there’s no need to look for an application, as we’re starting with Bob Bradley’s 4-4-2. Note: The following article is archived in our Tactics section. You can find it here. All teams, from the lowest club division to the top echelon of international soccer, must consistently seek a balance between individual brilliance and unified team discipline. 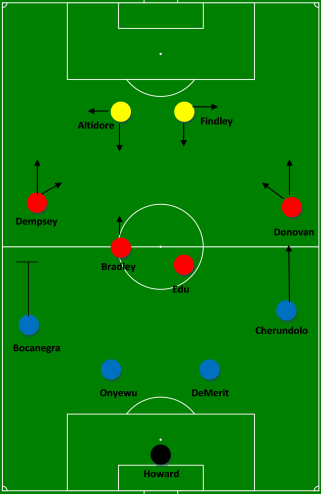 Bob Bradley’s solution was to craft a 4-4-2 that allows the USA to maintain defensive discipline yet simultaneously make use of its most talented players, Landon Donovan and Clint Dempsey. In essence, Bradley the Elder almost always has three players in the backline. As always, their roles are geared toward allowing the wingers to make full-use of their talents. The trio creates a sturdy-enough base for Dempsey and Donovan to work their magic. 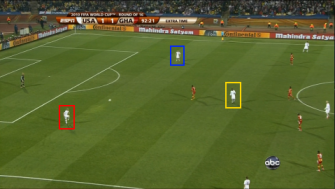 Gringos, what do you think of Bradley’s 4-4-2? Is it ingenious or insipid? It works. I question player selection. I have nightmares about Robbie Findley. As you say, in the past it has been a smart use of resources. The Confed. Cup was an awesome run. With the introduction of new players with different talents (i.e. Holden, Jones) we’ll have to see how Bob might adapt. The good thing is the flexibility of Landy and the Texas Hammer (Clint)–either would make a nice withdrawn striker if someone else can take up the wing. Is it me, or is the USA’s 4-4-2 style the exact same as my high school setup?